Very.co.uk kindly sent me a £25 off code and because I'm a sucker for a money off deal, I gave in and ended up online shopping. I'm certainly not afraid of any kind of print and love colour so I knew I just had to have this graphic floral print skirt, perfect for a warm sunny day or a night out! It seems to be a popular one, as it's already sold out on ASOS & there's only a few sizes remaining on Very. I loved it to the point that I bought the size 8, knowing it wasn't going to fit! Instead I got it altered (yes, i'm getting a bit obsessed with this tailoring malarkey). Ps. not so great pics as the trusty iPhone made an appearance for quickness! 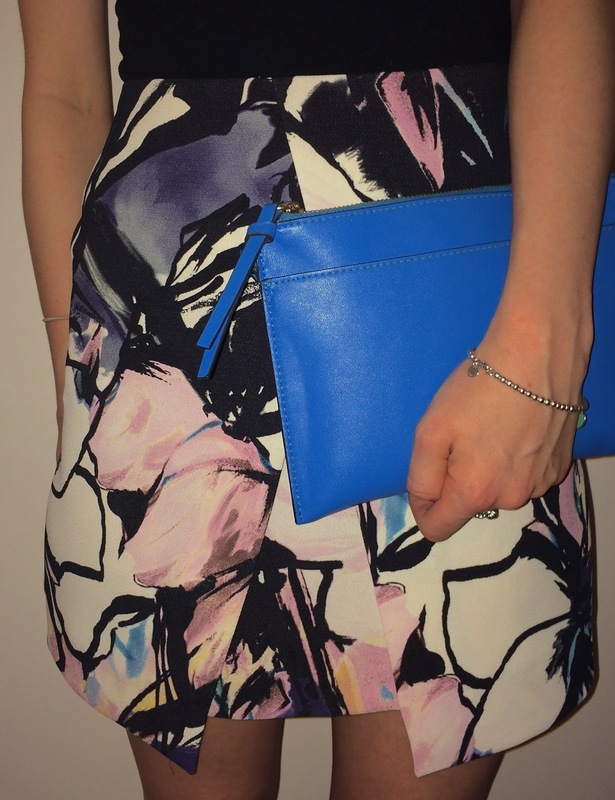 This blue of your clutch is my favourite colour!